The following Terms and Conditions apply to all travel and travel related Services offered for sale by VACAYA, LLC (“VACAYA”) and/or its officers, directors, employees, representatives, affiliates, agents, or subcontractors (hereinafter referred to as “VACAYA, “we,” or “us”). VACAYA is located at 141 Nevins St. Suite 130, Brooklyn, New York, 11217. All bookings of Trips are also subject to the Terms and Conditions of the Supplier of the Service(s) incorporated in a Trip. By placing an order with VACAYA, you agree to abide by all the Terms and Conditions of the applicable Suppliers without reservation, and to be bound by the limitations therein. If the Supplier’s Terms and Conditions are ever in conflict with the Terms and Conditions of VACAYA, VACAYA’s will control all issues relating to the liabilities and responsibilities of VACAYA. These Terms and Conditions contain penalties for cancellation as well as certain limitations of liability. Please read these Terms and Conditions carefully, ask us any questions you have about them and/or consult an attorney before you agree to be bound by them. Guest acknowledges that they have taken note of these Terms and Conditions before making a booking and have accepted the same. 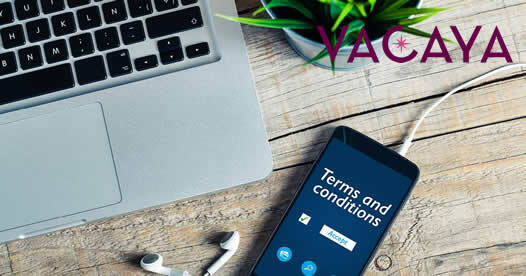 Booking with VACAYA is not possible without your acceptance to these Terms and Conditions. • This VACAYA Guest Agreement and its terms and conditions are herein referred to as these “Terms and Conditions” or this “Agreement”. • The term “Service(s)” as used herein encompasses: travel planning and consultation, passage on cruises, charters, and other water vessels, tours, leisure or adventure activities, hotels rooms, resorts, or other lodgings, air travel, spa services, equipment rentals, expeditions, restaurants or meal services, Trip insurance and any other travel or travel related products offered or sold by VACAYA. • The term “Trip” is defined as any Service, or package of Services, offered or sold by us. • “Supplier” or “Vendor” refers to any provider of the Services we offer. • “Itinerary” refers to the particularized schedule for a Trip as described in the Trip overview on our website or in our brochure. • References herein to “Guest,” “Client,” or “you” shall apply to each and any of the following: a party participating in an offered Trip and/or the party who purchases (or attempts to purchase) a Trip for themselves and/or others. The Services offered by VACAYA are available for purchase by residents of the United States while in the United States, its territories, possessions, and protectorates who have all the requisite power and authority to enter into and perform the obligations under these Terms and Conditions and may legally do so. No unaccompanied minors (those under 18 years of age) will be accepted. The Guest who submits a Trip reservation for others must be over the age of 18 to purchase a Trip and agree to these Terms and Conditions. If travelling with a minor, the minor’s parent or guardian accompanying them must accept full responsibility for the minor. The Services are also available for purchase by international Guests, as long as they recognize that this is U.S. business operated under U.S. laws. Any disputes that may arise will be decided pursuant to U.S. law according to our Mandatory Binding Arbitration provision and Choice of Law clause, below, et sec. Our Terms and Conditions may be amended or modified by us at any time, without notice, on the understanding that such changes will not apply to Trips booked prior to the amendment or modification. It is therefore essential that you consult and accept our Terms and Conditions at the time of making a booking, particularly in order to determine which provisions are in operation at that time in case they have changed since the last time you booked a Trip with VACAYA or reviewed our Terms and Conditions. All pricing featured on our website and in brochures are current at the time of publication and are subject to change without notice. Furthermore, VACAYA Itineraries, pricing, policies and procedures are constantly evolving. VACAYA strives to ensure all information listed is correct at the time of publication. However, any information contained herein, including but not limited to pricing, is subject to change without notice, and VACAYA reserves the right to refuse to honor any prices that were erroneously printed or quoted. VACAYA is not responsible for any misprints appearing in any online and/or printed media. All rates are subject to Fuel Supplement Charges and Currency Rate fluctuations at any time before or after final payment. Our Trip fares are per person, based on two people occupying a room or cabin (unless otherwise noted). If you prefer single accommodations, and if they are available, most Trips have supplemental rates for single travelers, so refer to the Trip overview on our website or ask your travel agent to learn more. Promotions, coupons and/or discounts offered by cruise lines/resorts, travel agents, and other Suppliers do not apply to charter travel. Additionally, all accepted promotions, discounts and coupons offered by VACAYA apply only to the qualifying Guest(s). A per Guest payment of 25% of the total Trip Fare is due at time of booking. Payment to VACAYA is limited to credit card (Visa, MasterCard, Discover, Diner’s Club, and American Express) and ACH payments. As a one-time courtesy, initial payments can be transferred to future Trips within 30 days of booking and prior to 240 days before the Trip. VACAYA Breeze and The V List must be paid in full at time of purchase and are non-refundable. Percentages apply to the total cost of the Trip, including port charges and gratuities. The above chart represents our standard cancellation fees. However, some of our promotions are non-refundable and will be specifically noted on our website. Particularly as a result of causes beyond our control (ie. weather and travel conditions, river water levels, political or environmental changes, equipment failure, flight schedule changes or rescheduling of air routes and times, referred to herein jointly as “Force Majeure”), we have on occasions had to make changes to and/or cancel confirmed bookings. While we always endeavor to avoid changes and cancellations, we must reserve the right to do so and to substitute alternative arrangements of comparable monetary value without compensation. 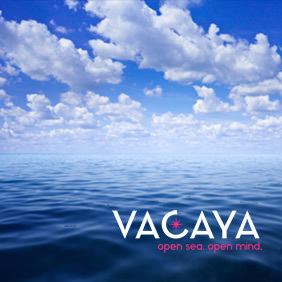 VACAYA reserves the right to adjust the Itinerary or change the modes of ground, sea, and air travel, change the quality of accommodations or otherwise change the Tour without prior notice. We accept no liability for loss of enjoyment as a result of these changes. VACAYA will attempt to provide advanced notice of any changes to Itinerary or Services to the extent possible. Any additional charges incurred arising from the postponement, delay or extension of a Trip or adjustment to the Itinerary due to Force Majeure will be the Participant’s responsibility. Participant accepts that cruise captains have full authorization to modify itineraries in the interest, enjoyment and safety of the passengers and vessel. VACAYA reserves the right in its sole discretion, and acting as intermediary or as agent for these Suppliers, to modify the Itinerary, components of the Itinerary, or the use of Suppliers that is best for the operation of a Trip. VACAYA is not responsible to any person for expense, loss of time, money, or other circumstances resulting from a failure of our Supplier, change in Itinerary, or change of Trip arrangements. VACAYA reserves the right to substitute at any time Services including, but not limited to: ships, ship staterooms, hotels, shows, airlines, restaurants, attractions, etc. Furthermore, your claim about these unforeseen changes has in no way an effect on your decision to cancel or in waiving cancellation penalties that will be imposed as a result of your cancellation. Additionally, all particularized Service requests (such as flight seating, stateroom types, hotel room types, etc.) are requests that cannot be guaranteed by us, and your participation in a Trip in no way assumes that you have been given any guarantees as to particularized Services. NO representative of VACAYA can make claims of these guarantees to the contrary. We also reserve the right to cancel any Trip prior to departure, and in such cases, all payments will be refunded without further obligation on our part. If a Guest leaves the Trip at any time, all return fares and other expenses will be assumed by the Guest. VACAYA reserves the right to retain up to its agency revenue in the event of cancellations for any reason described herein. For a fee of $100 per person, Guest replacements can be made on paid-in-full reservations in which no refund of fare needs to be made. For changes to reservations with a balance due or where funds need to be refunded and repaid, a fee of 6% plus any difference between the original and current sales price will be payable in full at the time of the change. Changes are also subject to any additional fees imposed by suppliers, airlines, cruise lines, hotels/resorts, transportation companies, sightseeing companies, restaurants, etc. All Guest replacements must be handled with a VACAYA Vacation Planner at least 14 days prior to departure. Transferability of airline tickets varies by carrier and shall be your sole responsibility. Before completing your online booking, be sure to check the spelling of your full legal name. Your name must match your passport/proof of citizenship exactly. If you’ve made a mistake, our Vacation Planners will be happy to help you correct it free of charge. However, that correction needs to be requested BEFORE the manifest for your Trip is generated (approximately 120 days out). Once the official cruise line’s/resort’s manifest has been generated, a name correction fee of $100 will be charged. If your credit card is declined for any payment, VACAYA will reach out to you (or your agent) immediately to rectify the situation. If 7 business days go by without resolution, your reservation may be cancelled and all payments up to that point forfeited. VACAYA requires you to give your full legal name, date of birth, and country of citizenship as it appears on your passport at the time of booking. Any changes in the spelling of your name after booking numbers have been issued will incur a $100 name correction fee. Passports, visas, and proof of citizenship could be required for travel. It is your responsibility to contact any authorities (U.S. Customs for Americans, or your Foreign Consulate office if you are not a U.S. citizen) to obtain any Passports, Visas, or Proof of Citizenship required. A valid passport must have six (6) months remaining on the passport after your planned return to the U.S. If it does not, you should renew your passport. VACAYA strongly advises that all Guests leaving the United States obtain a valid passport for travel. Some countries may deny entry due to current and/or past legal issues. It is your responsibility to check with the consulate to ensure any legal issues past and/or present do not prevent you from entering any countries you may be visiting on your Trip. Some countries/vendors (e.g., cruise lines, airlines, etc.) may deny entry, exit, or boarding due to past or present legal issues or past or present citizenship status. It is YOUR responsibility to confirm ANY of the above-mentioned matters with the proper government agency. This is your only notice about providing proof of citizenship, passports, and visas. VACAYA is not responsible for your lack of proper identification or denied entries/denied boarding. Optional pre/post tours may require a minimum number of passengers in order to operate. Should VACAYA cancel an optional pre/post tour, you will be refunded in full. Any cancellations initiated by you will be subject to current cancellation penalties. Reservations on optional tours are non-transferable and non-refundable after booking, including, but not limited to, cancellation of port by Cruise Line or weather issues. By booking an optional tour, you acknowledge that excursions cannot be canceled for any reason including but not limited to, regret of purchase, etc. Additionally, while no revisions of the itinerary are anticipated, VACAYA reserves the right to change any tour, schedule, or price, or to substitute stops and attractions on any tour without notice, and to use substitute equipment as necessary. You must contact your Travel Insurance provider to insure your optional tour purchase (or any other additional purchases made to the reservation). Do not assume that tours are insured because you have a policy on your base cruise or resort travel arrangements. VACAYA will not be held responsible for tours not insured by your insurance provider. We reserve the right to require a minimum number of passengers to operate any tour. Any tour canceled by VACAYA will be promptly refunded. VACAYA highly recommends that you review optional tours offered by the cruise line/vendor as well as their terms and conditions to ensure you choose the Optional Tours that best fit your travel needs. Additionally, please review your signed passenger information agreement and our general terms and conditions for the Trip. That agreement applies to any optional tours you purchase from VACAYA. VACAYA is acting as intermediary or as an agent for Suppliers, airlines, cruise lines, hotels, motor coach, restaurants, sightseeing companies, other travel agencies, etc., in selling Services or in accepting reservations or bookings for Services which are not directly supplied by us. Therefore, VACAYA shall not be held responsible for any intentional or unintentional or careless actions or omissions on part of such Suppliers which will result in any loss, damage, delay, or injury to you or your travel companions or group members. By participating in our Optional Tour program, you confirm that you will not, at any time, dispute any charges or process a chargeback with your credit card company. Should a credit card dispute or chargeback occur, you agree to pay VACAYA for any costs involved in said dispute or chargeback, including but not limited to Bank fees, Legal fees and administrative costs. Any hotel that requires Guests to pay a “Resort Fee,” “Tourist Tax,” or “City Tax” upon arrival at the hotel will be the responsibility of the Guest to be paid to the hotel in local currency upon arrival. In cases where VACAYA is unable to pre-pay these taxes & fees on behalf of Client, VACAYA shall not be held liable to any traveler for reimbursement of these taxes & fees. Should you have to cancel your Trip because of illness, injury or death to you or an immediate family member, depending on the type of coverage purchased, Trip cancellation insurance may protect some or all deposits and payments for both air and Trip costs. Trip cancellation and interruption penalties can be significant. Purchasing Trip cancellation insurance at a much later date may limit some of the coverage as to pre-existing or other conditions. We highly suggest all Guests purchase third-party travel protection insurance, which offers benefits for Trip cancellation/interruption and more. Please read the related travel protection Plan Document carefully. It is recommended that you compare and review other travel protection before purchase. VACAYA does not own nor operate any travel protection provider, nor has any influence in the outcome of any claim. It is Guest’s responsibility to understand the limitations of their insurance coverage and purchase additional insurance as needed. It is the Guest’s sole responsibility to research, evaluate and purchase appropriate coverage. Guest agrees that VACAYA is not responsible for any uninsured losses. Fom time to time, VACAYA may offer charter flight opportunities. Once VACAYA issues any airline ticket, said ticket will be 100% non-refundable/non-changeable/non-transferable. VACAYA does not pay ANY airline imposed fees for Baggage, Seating Assignments, Check-In Fees, etc. TSA requires that names on Airline tickets MUST MATCH the name as it appears on your passport. Having an incorrectly spelled name could result in additional fees, a new ticket being purchased, and/or denied boarding. ANY costs involving a name change to an airline ticket will be the responsibility of the traveler. VACAYA is not responsible if an airline delays a flight for any reason, including weather. If you are unable to make your departure, it is your responsibility to work with an alternate carrier to reach your destination. 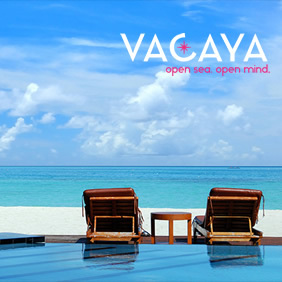 VACAYA is not responsible for any additional expenses you may incur prior to joining your Trip. VACAYA does not participate in, nor can we assist in any frequent flyer programs. We welcome Guests with special needs. Guests who have any medical, physical, or other special needs should contact VACAYA within 60 days of departure to initiate additional assistance through us. Guest are also encouraged to contact the cruise line or resort directly as well. Guest should be aware that each country has its own standards of accessibility for persons with disabilities. No pets or other animals, except for certain necessary service animals of a disabled Guest, are allowed onboard the ship/at the resort. Guests wishing to bring a service animal with them must notify Cruise Line/Resort directly at the time of booking to receive written approval. VACAYA has no part in obtaining service animal waivers as this is the sole responsibility of the Guest. VACAYA Vacation Planners will refer you directly to the Cruise Line/Resort. 1. VACAYA staff photographers/videographers (wearing name badges) may from time to time request that you be the main focus of a promotional photo or video shot. They will announce themselves and invite you into the shot. If you prefer not to be the focus of a promotional shot, please let them know at that time and they will immediately honor your request. Our photo shoots are very obvious and avoiding them (if you so choose) will be easily accomplished. 2. VACAYA staff photographers/videographers may inadvertently capture you in the background of a shot they are capturing for our promotional purposes. In this case, you may not be provided with individual notice nor will we seek your approval. By participating in a VACAYA vacation, you and all Guests traveling on your reservation grant and authorize VACAYA the right to capture, edit, alter, copy, exhibit, publish, distribute and make use of any and all pictures or video taken of you to be used in and/or for legally promotional materials including, but not limited to, newsletters, flyers, posters, brochures, advertisements, fundraising letters, annual reports, press kits, websites, social networking sites, and other print and digital communications, without payment or any other consideration. This authorization shall continue globally and into perpetuity. You understand and agree that these materials shall become the property of VACAYA and will not be returned. You hereby hold harmless, and release VACAYA from all liability, petitions, and causes of action which you, your heirs, representative, executors, administrators, or any other persons may make while acting on your behalf or on behalf of your estate. All Guests will be required to agree to the Code of Conduct of the Cruise Supplier for their Trip and follow those guidelines to the best of their abilities. Guest understands that their participation in a Trip may be terminated at any time if Guest is disciplined by any civil or criminal authorities, our Suppliers, or if VACAYA, in its sole discretion, determines that Guest’s conduct or behavior is incompatible with the interests, safety or welfare of other Guests, our Suppliers, their employees, or independent contractors. VACAYA has zero tolerance for any non-consensual sexual contact, harassing of other Guests or Suppliers, or threatening behavior by its Guests. Termination for conduct violations will result in mandatory disembarkation from the ship/removal from the resort with no refund for any unused portion of the fare or other pre-purchased items including your excursions, pre/post accommodations, and return airfare. Guest is responsible for arranging and paying for their own substitute travel and accommodations, if necessary. You shall not solicit other Guests for commercial purposes or advertise goods and services onboard the ship or at the resort without VACAYA’s prior written permission. Solicitation in any form will result in mandatory disembarkation from the ship/removal from the resort with no refund for any unused portion of the fare or other pre-purchased items including your excursions, pre/post accommodations, and return airfare. All Guests must obey the local laws and regulations of the places they visit on their Trip, including their medicinal and/or recreational drug laws and restrictions regarding alcohol consumption. VACAYA is not liable or responsible for any damages, costs and/or added expenses incurred as a result of Guest’s failure to obey any local or federal laws. If Guest is detained, arrested, or otherwise held for failing to meet these requirements, Guest is responsible for arranging and paying for their own substitute travel and Accommodations, if necessary. VACAYA is not responsible for the costs of any medical treatment you may require during a Trip and assumes no liability regarding provision of medical care or lack thereof that you may receive while on the Trip.